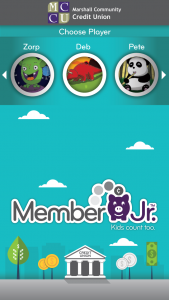 HT Mobile Apps talked with Andrea Tucker, Financial Education Coordinator at Marshall Community Credit Union, Marshall, Michigan (2 branches, $166 million in assets) about Member Jr.
How did you hear about Member Jr? I met Kathleen Craig (HT Mobile Apps founder) at the National Youth Involvement Board Conference last summer. HT Mobile had an incentive to download the Member Jr app that enticed me to take it for a test drive. Once I started playing with it, I realized it was really cool. 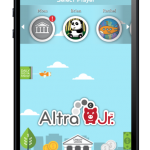 I liked that Member Jr was teaching money skills, helping kids set savings goals and gave parents control over the app. But my next thought was a disappointed, ‘there’s no way our credit union would be able to afford an app like this’. I knew how much we paid for our mobile banking app so I expected we could not afford a financial education app. I cautiously asked for pricing and was delighted to learn how affordable Member Jr was for our credit union. After meeting with our CEO that fall, we put it into our budget for 2015. Did you involve your employees in testing Member Jr? Yes. It’s helpful to have staff try out a new product or service so they can easily talk about it to our members. 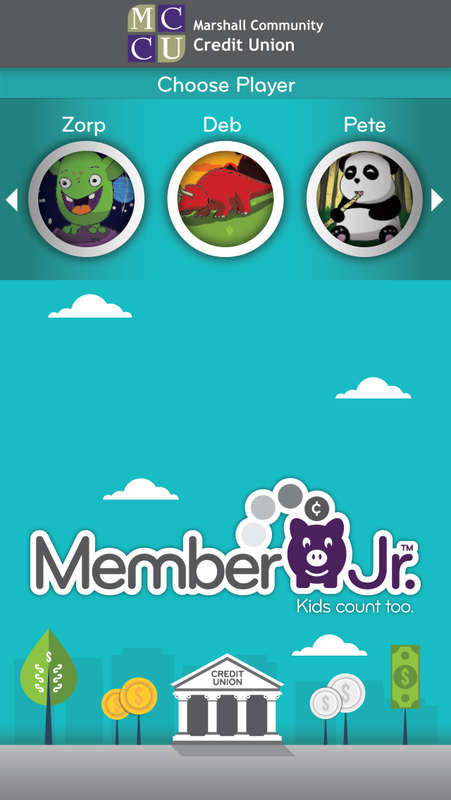 We did an initial launch of Member Jr with our staff over the summer. Those with elementary and preschool age kids were very interested in the app. We have a lot of parents on our staff so it went over really well. We also offered a mini incentive to download the app and rate it in the iTunes or Google Play app stores. They all seemed really excited about it. Some of the adults even admitted that they found the games to be super fun. What are you doing to launch Member Jr? We’ll be visiting all the open houses where we have student-run branches. We have eight of these branches. We’ll have handouts for parents to take home and tablets available to demonstrate Member Jr. We’ll be emphasizing this is a free app that parents appreciate and kids enjoy. During the school year we will incorporate Member Jr to help children track their savings goals as part of our student-run branch program. We think Member Jr will be a good fit for this program as kids always want to know their progress toward their savings goals. Now they can track it as often as they wish, at home. We will also be featuring Member Jr on the bulletin boards we have in the schools, as well as in presentations to parents and to kids in the classroom. We’ll be including it in our monthly parent newsletter and our member newsletter. Any tips for other financial institutions looking at Member Jr? Give it serious consideration. Don’t dismiss that it might be too expensive for your credit union. Technology usually means a big investment but Member Jr is priced so smaller financial institutions can afford it. HT Mobile has priced it to be a cost effective and affordable financial education tool. Don’t hesitate to ask a lot of questions. The HT Mobile team is very helpful and wants to explain everything clearly so you understand exactly what you are getting. Setting up your financial institution’s version of Member Jr is easier than you think. I’m not very tech savvy so I was a little unsure I could handle the set up without involving our IT people. But the whole process went very smoothly. HT Mobile is quick to respond and is with you the whole way. It was a great experience from signing the contracts until launch.